May 14, 2017 by Robin S.
I’ve got more Microprose and Legend of Zelda articles in the pipeline, but this Nerdstalgia installment is a little bit different. It was inspired by a post at IGN about the nostalgia of The Legend of Zelda: Breath of the Wild. Where that author talked about gaming with his mother, my memories of gaming as a child are with my maternal grandmother 1. She played a lot of games over the years, but there are a few that we played together that stand out in my mind. I’m starting with Dr. Mario for a couple of reasons. The first reason is that it’s the game I remember her playing the most, but it’s also the game that caused the least amount of strife, which isn’t to say that it caused no strife at all. Dr. Mario was a fairly simple puzzle game, originally released on NES and Gameboy in 1990. 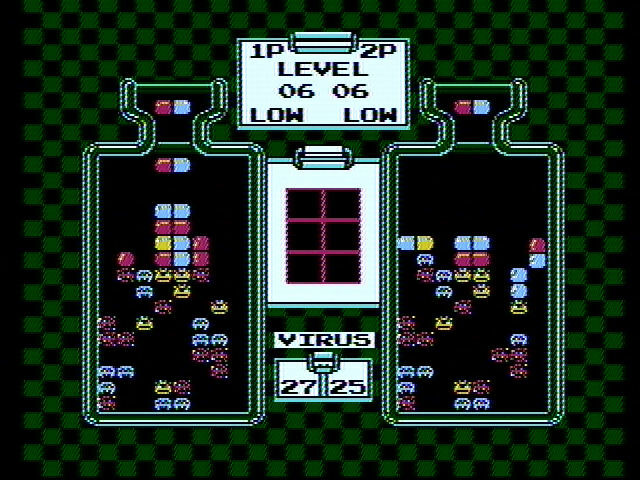 The idea was that there were “viruses” on the play field that could be removed if they were paired with pills of the same color. 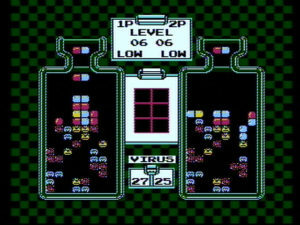 It was a game that was very much in the same family as Tetris, but, unlike Tetris, there were levels and an “end” in sight: you needed to clear all the viruses to move to the next board, which would have more viruses and move faster. Most importantly, there was one major difference for the NES version: competitive multiplayer. Multiplayer worked with a split screen, with both players having access to their own separate board. Combos would send random pill pieces to the other player’s board, allowing you to spam them, giving you a slight advantage. That caused plenty of frustration and grumbles from both of us, but it was mostly friendly competition. Dr. Mario is available on the Nintendo eShop as a Virtual Console title. The NES version is available on the Wii U, and the Game Boy version is available on the 3DS. The World Map was the site of many strategic ambushes. The third installment of the Super Mario Bros. was actually featured in a movie, The Wizard, before it was released in the United States in February of 1990. 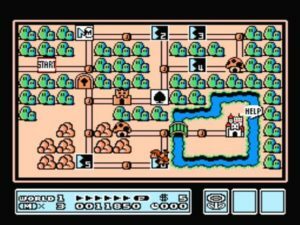 Unlike Dr. Mario, the multiplayer of Super Mario Bros. 3 was alternating and more-or-less cooperative, as players took turns clearing levels (or attempting to) while working their way through various kingdoms to track down Bowser and rescue the once-again-kidnapped Princess Peach. Super Mario Bros. 3 featured a return to the type of platforming that was seen in the original Super Mario Bros., after a departure in Super Mario Bros. 2 (which wasn’t originally a Mario game in Japan, which explains the departure). It added some new enemies (including the Koopalings, who appear in several modern games) and some new abilities for Mario and Luigi, while removing Luigi’s ability to jump higher than his brother. At the end of each level, players were awarded a card. Collecting three cards would earn extra lives (depending on whether your cards matched or not). I said the game’s multiplayer was mostly alternating and cooperative, and those cards play heavily into the exception. If the currently active player passed over the “on-deck” player on the map, the “on-deck” player could challenge them to an original Mario Bros.-style duel. During these duels, cards could be stolen from the other player 2. The winner of the duel became the active player, a fact that could be used to prevent your fellow player from accessing a bonus game in certain situations. The frustration and friendly competition from Dr. Mario was somewhat amplified when playing Super Mario Bros., because the “betrayal” of an ostensibly friendly fellow player (read: grandchild) was, sometimes, considered cheating by my grandmother. Before I get to the most divisive video game that my grandmother and I played, I’d like to give a quick mention to a classic family card game that was also pretty divisive. Uno is a fairly simple game, and I’m pretty sure every citizen of the United States over the age of 10 has played it as some point in their lives. At one point, when I was very young, I was frustrated by my inability to win consistently, and I attempted to stack the deck (literally) in my favor while shuffling for a new hand in Uno. I lost, despite my attempt at cheating, and I was caught, which caused my behavior in any game from that point forward to be viewed with more than a little suspicion, which probably contributed to some of the hostility caused by the last video game on my list. Unfortunately, it wasn’t possible to get a good picture of multiplayer Lemmings. Lemmings is one of the first indirect-control, real-time games. It’s considered to be more of a puzzle game than a strategy game, but its gameplay inspired a lot of the gameplay of early real-time strategy games. Even more than Super Mario Bros. 3, Lemmings is primarily a single-player game. Most people who remember Lemmings remember it purely as a single-player puzzle game, and probably never played the multiplayer version much. Basically, the multiplayer game is played on a split-screen like Dr. Mario, but, unlike Dr. Mario, the players share a single map. 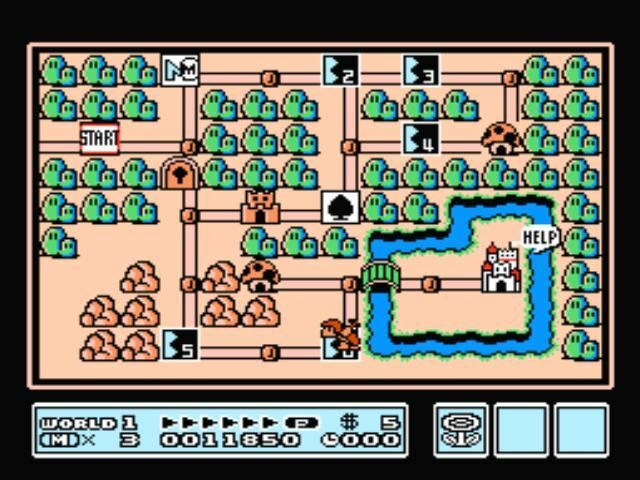 Usually, the players would find all their Lemmings entering the map in the center, and would have to work their way to one side or the other to find the exit. Each player had their own team of Lemmings, and the goal was to save more Lemmings than your opponent. My grandmother saw this as something like a race, where you were competing as much against yourself as the opponent, and there wasn’t really much interaction between the two players. I saw it more as a game that had both offense and defense, and it was infinitely easier when your opponent wasn’t really playing defense. I’d take most of my Lemmings and go to solve the puzzle, but I’d manipulate one or two to travel the other way, usually after a short delay so they were mixed in among my grandmother’s Lemmings. I’d then alternate between solving the puzzles on my side of the map and subtly sabotaging my grandmother’s solutions (or not so subtly, if I could find a way to start killing Lemmings en masse). This behavior was generally considered fair game by me (after all, you can’t cheat at a video game, outside of hacking; if the game designers allowed it, it’s within the rules), but was considered to be cheating of the worst kind by my grandmother. After a few games where I would promise not to screw with her design (and kept the promise), I would always slowly go back to my sabotaging ways. Eventually, she refused to play Lemmings with me anymore due to this fundamental difference of opinions about how the game was meant to be played. To my knowledge, there is no place available to buy the original Lemmings for any of the systems on which it was released. All screenshots here were taken from my copy of the PC game, which I play primarily on DosBox (along with several other old Windows and Dos games that I can’t find anymore). I know I’ve made it sound like my time playing games with my grandmother was full of fighting, but, honestly, even the “fighting” was with a friendly and loving tone (mostly). The nostalgia I get when I fire up Nintendo’s Virtual Console or my copy of DosBox is very strong, and I’ve found that I’m unable to play Dr. Mario with the music on because nostalgia starts to overwhelm me a bit. My grandmothers both contributed to my love of video games as a hobby, and I will always be grateful to them for that. Posted in Uncategorized, Video Games. Tagged Dr. Mario, Lemmings, Mothers' Day, Nerdstalgia, Super Mario Bros. 3.